Shoreham Airport has been adopted as the Club's main training location. This is because of the absence of Controlled Airspace locally, and the availability of VATSIM ATC services several nights a week. 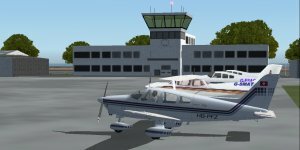 Members can start their online flying experience here in the company of other beginners and, via the Club TeamSpeak server, obtain help from experienced members also flying from this pretty seaside location. Real World Shoreham Airport is the oldest licensed airfield in the UK, and has a beautiful Grade II listed art deco building which is not only a Control Tower but also a full scale Passenger Terminal. Opened in 1931 as Staverton Aerodrome, Gloucestershire Airport has been progressively developed during the last 85 years into the UK's busiest General Aviation aerodrome. It lies just four miles from Cheltenham, home of prestigious horse-racing, literature and music festivals and only six miles from the cathedral city of Gloucester. It has a full Air Traffic Control service within its ATZ and Approach control facilities as well. On VATSIM, it caters for the needs of virtual GA pilots with procedures that closely replicate the real aerodrome. There are 3 runways in the traditional ex RAF 'A' layout, plus a short grass runway. The main runway has instrument procedures including a CAT 1 ILS on runway 27. The Club established its base at Gloucestershire in December 2004 and adopted one of the hangars for its use. Regular Club evenings have been held on Tuesdays at the airfield ever since. In April 2018, the Club decided to open this small airfield in Yorkshire as a new northern base. It is located in an area of outstanding natural beauty 11 nautical miles south west of York. During the Second World War it was used as a Royal Air Force station and Blackburn Aircraft built almost 1700 Fairey Swordfish naval torpedo aircraft at their Sherburn factory. Today it is home to a busy real-world Aero Club who have kindly rented us one of their hangars and allowed us to build our own small Clubhouse next to theirs. As an uncontrolled airfield (Air/Ground Operated), with one hard runway and three grass runways and mandatory overhead joins, members will enjoy a new experience and new challenges at this friendly airfield. As a move towards exporing more UK airports, the Club has decided to adopt one of them as a Roving Base. The plan is to change the base every three months. More bases will be added as they are selected. The currently active Roving Base is marked by red pointers below. Club members visiting that airport will be awarded a star. Information related to past Roving Base selections is also shown below. In addition to the above Base Locations, each month our Events Manager selects some other airfields for members to visit. These may be defined as Guest Airfields or Farm Strips. Briefings will not be provided by the Club, and members must choose their own route and do their own flight planning. The idea is to encourage members to explore Britain by Flight Simulator and provide at least some challenging flights. The Club Star Awards process is used to analyse each member's Pilot Reports and to allocate Stars for recording visits to these locations. These charts compare the Club's relative flying activity across our base and guest locations, for the last two months as reported by our members using the Club's PIREP facility.